An alternative title for this post might be: Not all Blues Go Together. My first Freesias, a blue variety, began blooming 2 weeks ago. 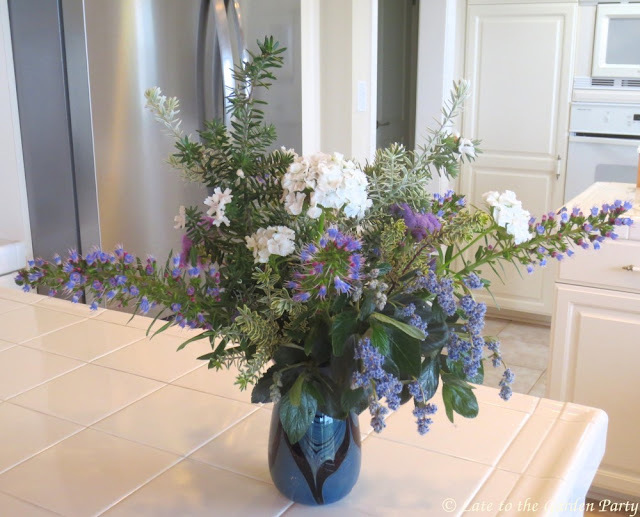 I wanted to use them in a vase and, when I discovered last week that the Ceanothus at the bottom of my back slope was also in bloom that sealed the deal on putting together a blue-themed vase. The trouble was: I didn't like how the Ceanothus and the Freesia looked alongside one another. So, I've got 2 vases - surprise! Yes, I know that's not much of a surprise from me but I'd intended to put together a second vase using red flowers in recognition of Valentine's Day. That plan was scrapped, at least for the time being. The first vase, featuring Ceanothus and Echium, bears some similarity to the vase I created 2 weeks ago but this one has its own personality. 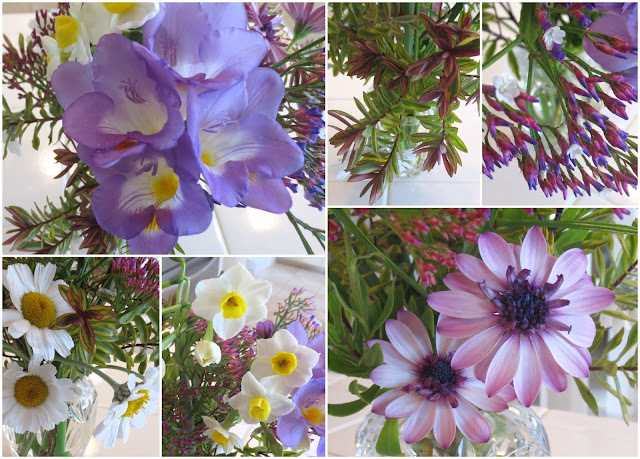 The Freesia went into a smaller vase, which ended up with a split personality of sorts. Last week's vases stood up surprisingly well but I chucked their contents on Sunday anyway. The new arrangements took over the usual spots. For more In a Vase on Monday posts, visit Cathy at Rambling in the Garden. Lovely as always! Looks like you've got a little more rain in your forecast. Your plants must be loving this unexpected moisture. I'd be more than happy to send you some of ours. I prefer to see snow in the mountains and from a suitable distance, Peter. We're all complaining about the cold here as it is and our temperatures are just in the low-to-mid 50s. There is something aout blue vases - I love them, possibly because there are not as many blue flowers around. You have used your collection of blues to great effect with ideal companions - both lovely! Thanks Kris! I adore blue flowers and try to grow just about any of them that have a chance of surviving in my climate, Cathy. I love the blue arrangement with the white elements. How wonderful it is to such such a variety...you are indeed a gifted gardener and arranger. I just have a more cooperative climate than many people, Noelle. Nice vases again this week. I like the blues. I also like that frog by the other vase. He is a cutie. I've had that frog longer than I can remember. He's already at the ready to standby and guard my flowers. Kris, I love your Narcissus included in the second arrangement. The blue and white design is delightful as well. Your Dianthus is very pure and appealing. I thought the Narcissus were late blooms of the same paperwhites I featured earlier until the flowers opened, Susie. These are growing among those paperwhites but the flowers are clearly different, another unknown variety left behind by a prior owner. 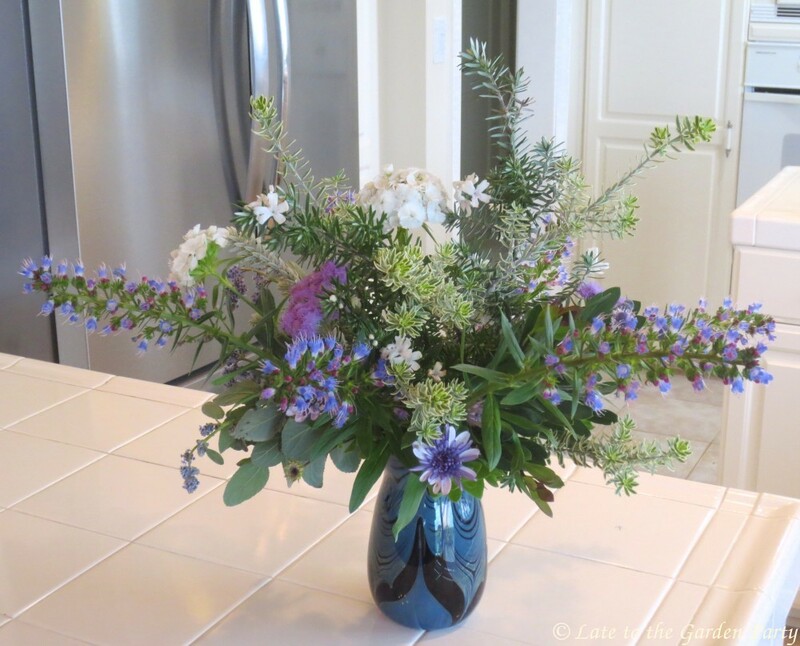 The bees DO love that Echium, Amanda. They rode along with me as I walked through the garden looking for other plants to accent my arrangement. I have to be careful when I bring the cut stems in the house to ensure I don't have hitchhikers! It feels like three arrangements with the two sides of the one pinkish vase. :) I like that idea. I hope you get some sun and warmer temperatures soon, Eliza! I love all the blues! I think those shades in your first bouquet are my favorite blues--kind of variations on French blue--although I like them all. 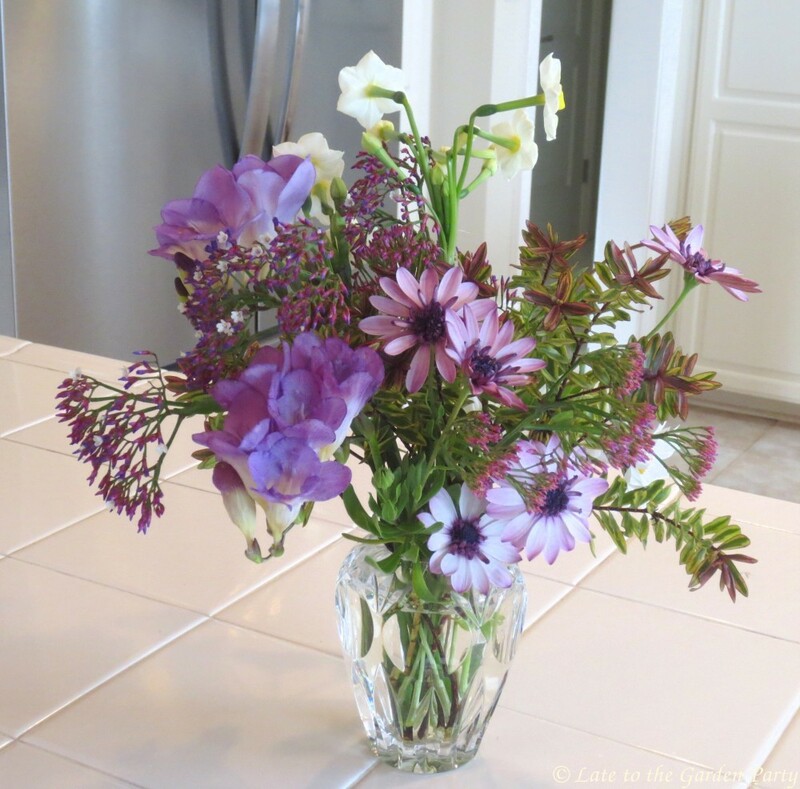 All your arrangements are amazing! French blue - that's a perfect description of the color, Beth. Lovely! I'm especially admiring the delicacy of that first vase. 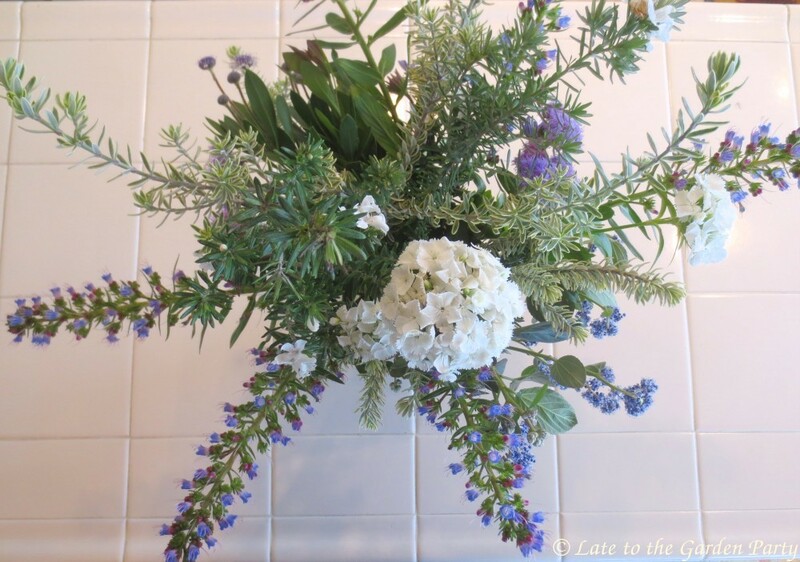 :) And the way the purple-tinted Limonium buds blend with the Hebe foliage in the second. I've been waiting more than a month for that Limonium to bloom, Amy. 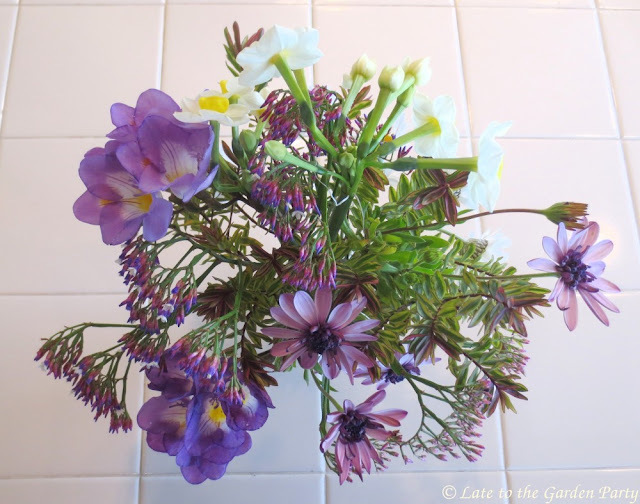 The flower stems appeared with buds but they seemed frozen in time for a longer period than I expected. I wish I could say that the second vase's split personality was intentional, Christina, but it came together that way somewhat by accident. Blue flowers are irresistible and it is amazing how many shades of blue there are. And of course so many so-called blues are actually purples. 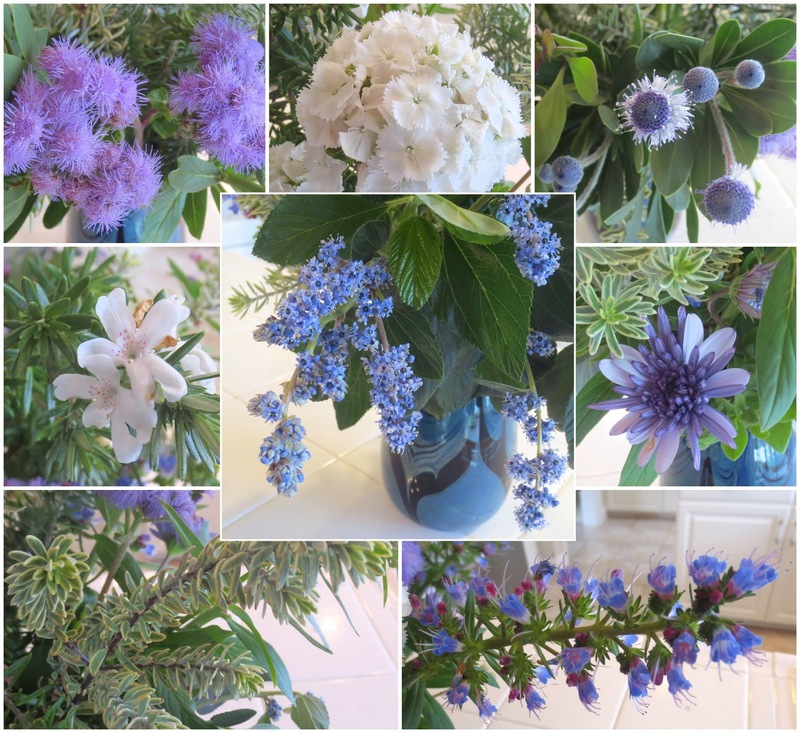 I love your blue arrangement, how amazing to have ceonothus in February. Your second arrangement is adorable too and to me it seems to have a real mix of seasons impossible to achieve here. We really just have 2 seasons, a long "warm" season and a shorter cool season, encompassing late fall through early spring. I expect that factors into why so many of the plants that flower in late spring and early summer in your climate appear so much earlier here. Two wonderful creations once again Kris! Seeing Narcissus in a vase with Osteospermum is unusual for me, but what a lovely combination! I wasn't quite sure about that particular combination, Cathy, which was why the Narcissus stems featured more prominently in the back view. If one likes blues in the garden, and I do, I think they are the most difficult color to visualize and keep track of while plant shopping. A large dose of white does the trick in or out of a vase I'm thinking. You're right, Linda - they need a bit of contrast to shine. 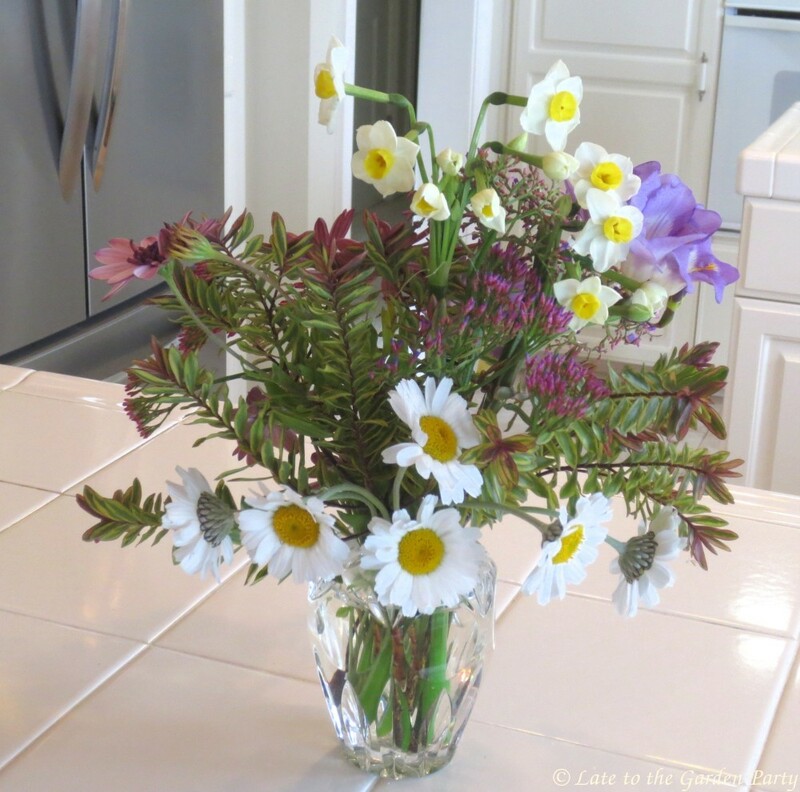 Simpler is often better when it comes to arrangements, Margaret. My problem is that, once I cut stems, I feel compelled to use all of them, resulting in over-cramming.